With my third little man well and truly into solids, I’m back in the land of purees and baby led weaning. When I had my first son I remember carefully crafting out meals for him to eat. I planned his weekly food intake to ensure he was getting the right balance of nutrients (particularly as he had a dairy and soy allergy). No wonder I was exhausted! Third time round things are much more relaxed, plus I’ve learnt a few tricks of the trade along the way. Here are my top tips as a third time mum for making solids less stress and more fun. This post is sponsored by Heinz. Honestly, a mess mat was probably the best purchase I made when introducing solids. 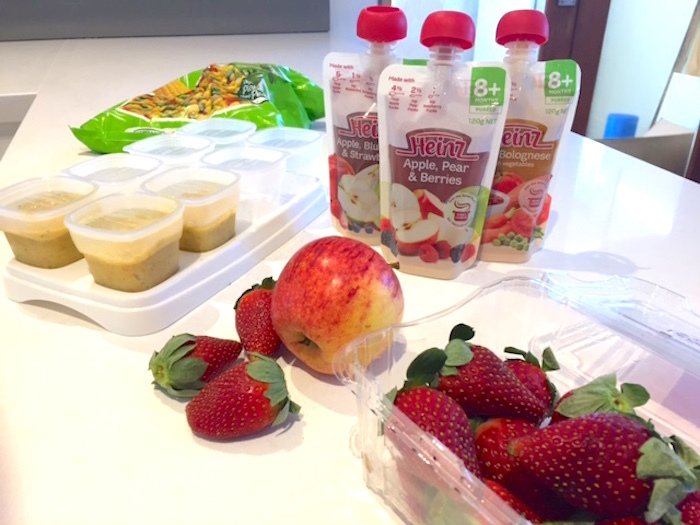 We did a mix of pureed food and baby led weaning (where you let bub feed themselves with whole foods). It is messy business! 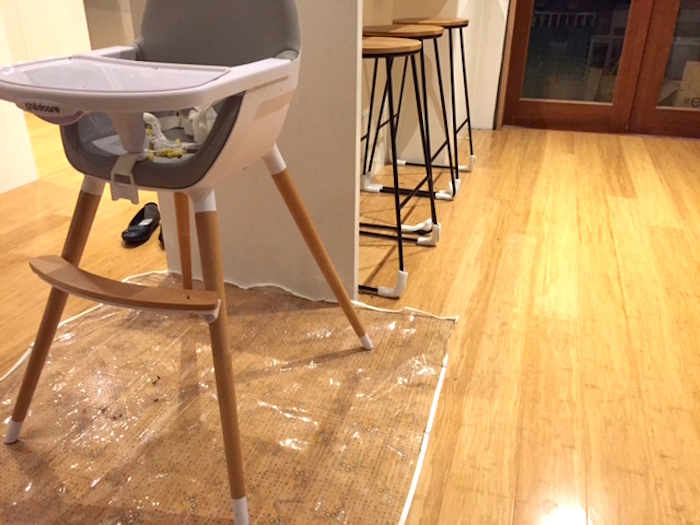 A mess mat is basically just a piece of plastic matting that you put under the high chair. You can buy it by the meter from fabric stores or “pre-made” from baby shops. Every baby takes to solids at a different rate. Try not to stress about how much bub is eating in those first few months. Keep offering and give variety but don’t push it. Make eating a social activity, let them see you eat, give them bits from your plate and see what they show interest in. 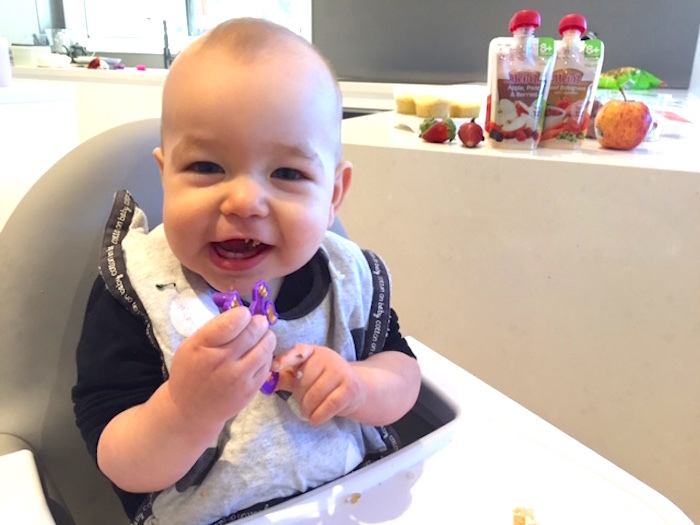 Some babies take better to purees where as others prefer to feed themselves whole foods right from the start. Take the lead from your baby and work at their pace. 3. You Don’t Have To Cook Everything! We all want our kids to eat healthily, but feeding them store bought food pouches doesn’t mean you are giving them second rate food. I remember as a first time mum saying that I’d only ever feed my child homemade food… oh how I laugh at myself now!! Keep a stash of pouches to grab on the go or when you don’t have time to cook. So mummas, cut yourself some slack. Infant food pouches like those by Heinz are a healthy convenient food that complements homemade perfectly. 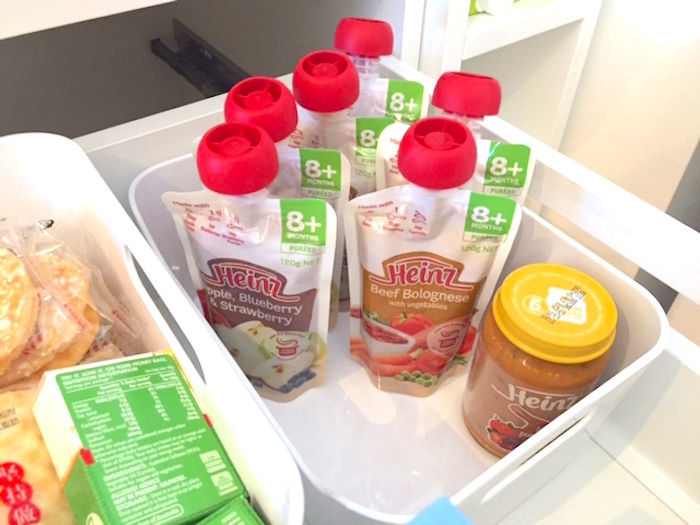 You can check out the Heinz Infant Pouch range here. When we first started solids I cooked up big batches of basic foods such as sweet potato, potato, parsnip, peas/corn/carrot mix etc, pureed them and then froze them in icecube trays. I then tipped the frozen segments out and stored them in the freezer in zip lock bags. As my little one’s diet expanded I combined different flavours and added in things like couscous and meats. Little people only eat small amounts so doing a bulk cook up will last you AGES. It might seem seriously gross to you to blend up the Sunday roast but honestly, they don’t care and it is so much easier. I blend up pretty much anything we are eating, adding in some potato or sweet potato puree to give a good texture if needed. I also offer our food whole (bits of steak, whole pieces of cauliflower, sushi) and let him tackle them in his high chair. He loves it! Stuffing his face with his brothers sushi and loving life. If you don’t like or eat certain foods or you have picky toddlers or kids in the house then it is easy to get in the habit of avoiding certain foods with your baby. Try to make sure to introduce and continue to give a wide variety of foods, even if you don’t personally like them (or your older kids now refuse to eat them!). My eldest child is a super fussy eater (and has been since he was a baby) and I made the mistake of introducing less variety to my next child initially. It took quite a while to get the little one eating those foods I hadn’t introduced earlier and I’m trying not to make the same mistake with my youngest. Remember, meal times are meant to be enjoyable family time. Set up the habits you want to continue with from the start. 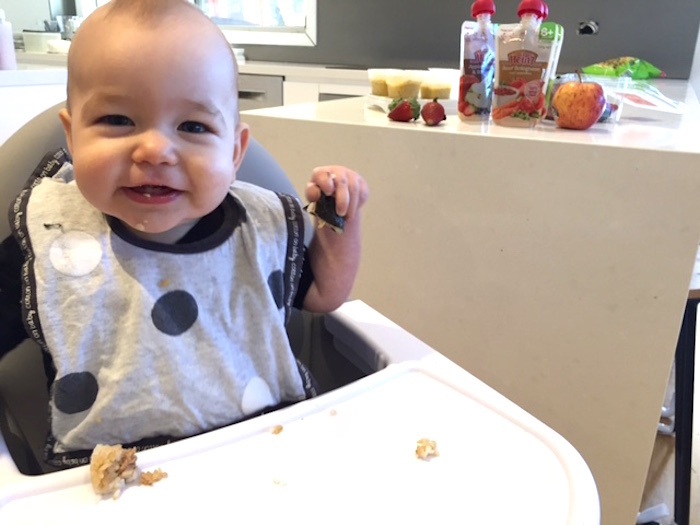 Chances are that at least one of your kids will go through a serious fussy period and throw any table manners they once had out the window so you may as well try and start well!